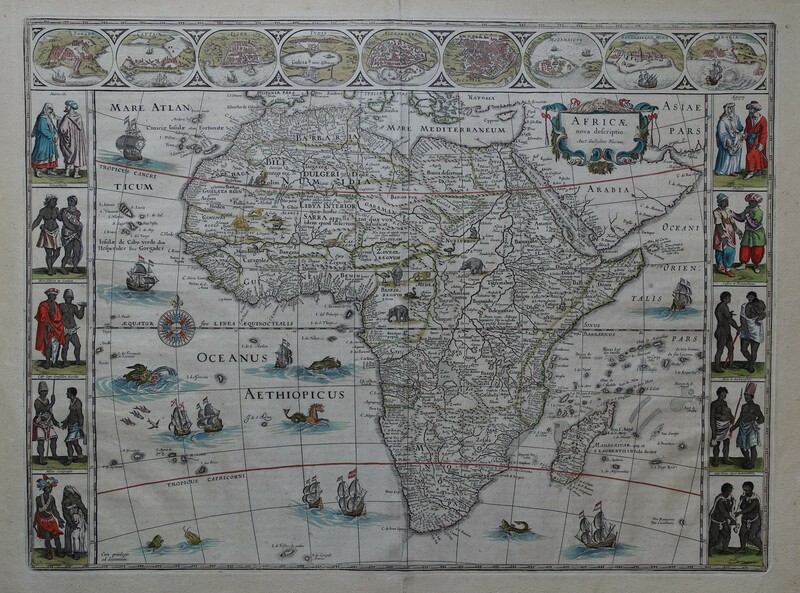 Old, antique map of Africa. Carte-a-Figures. Upper right corner cartouche with title and name of Willem Blaeu. On both sides borders with costumed figures. People from different countries and areas of Africa. Left border, from top to bottom Marocchi (Morroccans), Senagenses (Senegalese), Mercatores in Guinea (traders in Guinea), Cab:lopo Gonsalvi Accolae and Miles Congensis (Congolese). Right border, from top to bottom Egyptians, Ethiopians, Mozambicans, King in Madagascar and inhabitants of the Cape of Good Hope. 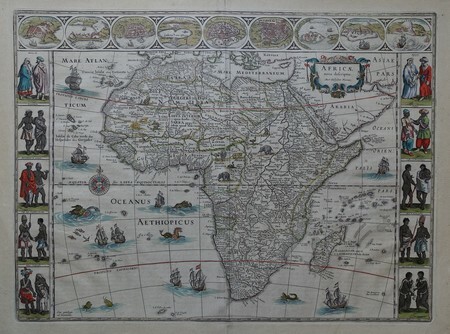 The decorative border above the map with nine oval framed African towns: Tanger (Tangiers); Ceuta, Alger (Algiers), Tunis, Alexandria, Alcair (Cairo), Mozambique (the island); S. Georgius della Mina (Elmina) and Canaria (Canary Islands). Verso Dutch text. Original col. copper engraving, published in Amsterdam circa 1644 by Willem Jansz. Blaeu in one of the Dutch atlas editions from 1642 onwards.